We have always been the type on a trip to go from point A. to point B. in as few stops along the way as possible. Gone are those days. Be prepared to make frequent stops that will be longer than a quick potty break. I know my 10 month old had a hard time sitting still in her carseat and I didn’t take advantage of break time enough. Get out and walk, stretch, or dance! 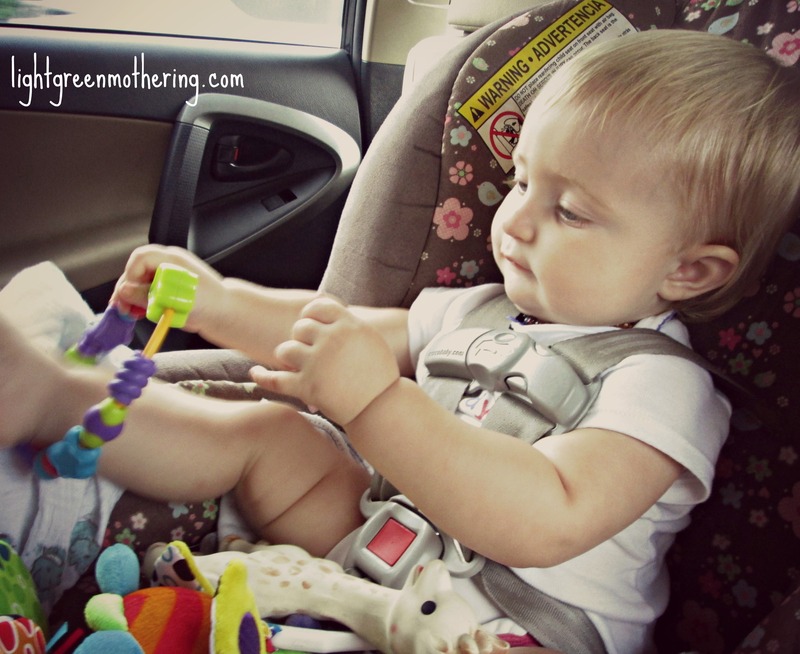 Babies are sometimes unpredictable, however, planning a few fun stops along the way is a great way to break up the sitting in the car. Many state parks are free and you can pull right off the highway and visit them. Also check out roadside America. You can find all kinds of interesting roadside attractions and map them out on your way. We will be planning WAY more of this next time. A great way to keep your little one entertained. I will be purchasing a few new items before our next trip so she has something new and exciting to play with. I might even suggest a swap of a few toys with a friend if you don’t want to buy a bunch of new stuff. Little h. Is still pretty much exclusively breast feeding, so her snacks were already packed (haha). We did ALOT of nursing on the road. It was certainly comfort for her. However if your child is into snacks, bring some healthy options for them to enjoy. I always bring apples for myself, which little h. thought was entertaining to play with and then discovered it had juice inside when teething on it. Just remember your in the car and kids will get messy with messy foods. We aren’t really pushing much technology on our babe at the moment. You can read HERE about our family and technology . However, I have heard many parents rave about watching movies on iPads and phone screens pretty much everywhere. It’s a very normal way to travel and it works very well for many parents. It’s a big part of our daily lives. We wake up and turn on music, so it’s only natural to want tons of it on your trip. We always compile multiple playlists to enjoy on each specific trip we go on. Just keep driving until they wake if you can do so. It was the best time for us to get miles under our tires. Overestimate your time for everything. Then no one feels the need to rush. Less stress, more fun! Now, in just a few days, we will be tackling Air Travel with an almost 1 year old. The adventures never stop. Do you have tips to share about your travel with a baby? I would love to hear them. This entry was posted in lightgreen baby, lightgreen family, Uncategorized and tagged baby, car travel, family vacation, packing, road trip, summer, Travel, travel survival, travel with baby, vacation by lightgreenmom. Bookmark the permalink. Totally understand. My girls have been so different in the car. One hated it. The other loves it for about an hour and then wants to not be sitting still.